It came as a bit of a surprise to Gabrielle Cardinal when she realized that her third year Exceptional Psychology course would be delivered with a fully digital textbook. The course had been selected to be part of the Digital Textbook Access pilot program. Cardinal recently completed her final year of Criminology and Youth and Children's Studies at Laurier's Brantford campus. Although she admits she is not as tech-savvy as her peers, she made the effort to embrace change and was happy to be part of a new and exciting pilot. 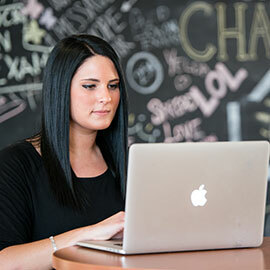 In September 2015, Laurier launched its inaugural Digital Textbook Access pilot program for five courses spanning both the Waterloo and Brantford campuses. Over the 2015/16 academic year, more than 960 students and 12 faculty members participated in the program. The Digital Textbook Access pilot program came with some great tools to assist Cardinal with her studying, such as highlighting and the advanced search options. In addition to the search tool, and the ease of highlighting important text, Cardinal enjoyed the fact that no matter where she was, she could simply open up her laptop and have instant access to her book. Another advantage to going digital is having access to the textbook on the first day of class. Digital Textbook Access gives students immediate access to the textbook without having to wait in long lines at the Bookstore. Not only does this new and exciting initiative save money, it also saves time. Due to the pilot’s initial success, Laurier is offering the Digital Textbook Access program to more students during the fall and winter terms. To learn more about Laurier’s Digital Textbook Access, visit the Bookstore website.